This game is an unlicensed version of N/A. 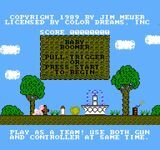 Baby Boomer is an unlicensed 1989 action video game created by Color Dreams for the NES. It was developed during 1988. As a baby crawls across the screen toward numerous dangers, such as birds of prey or bottomless pits, the player uses his/her NES Zapper to shoot hazards before they hurt the baby. Shooting birds kills them; shooting clouds makes them form ice bridges over pits. Level environments include a graveyard, heaven, and hell. Up to two players can participate simultaneously and use the basic NES controller along with the Zapper. This game was Color Dreams' first game. Like their other unlicensed games, rather than the typical grey NES cartridge, Baby Boomer is baby blue with an altered design. Source: Wikipedia, "Baby Boomer (video game)", available under the CC-BY-SA License.